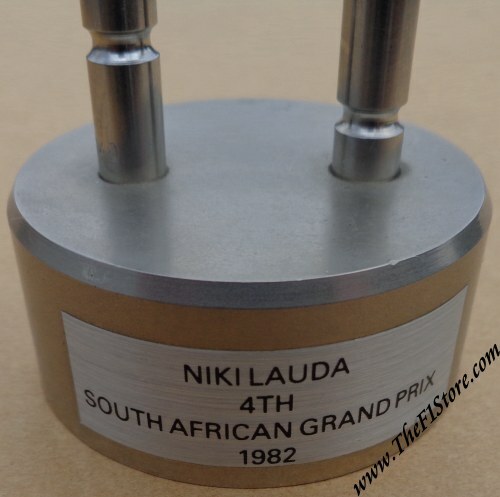 Mounted set of valves from Niki Lauda's McLaren MP1/4B South Africa 1982. 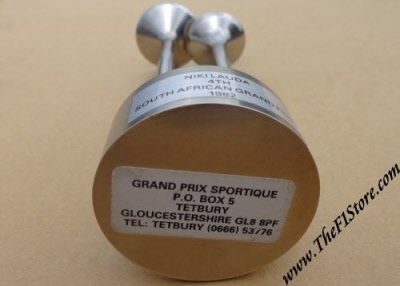 Here we have a set of polished and chromed valves (inlet and outlet) from the Ford Cosworth DFV engine with which he came in 4th in the 1982 Grand Prix of South Africe. After Ron Dennis had lured Niki back out of "retirement", this Grand Prix was Niki's very first after his voluntary 2,5 year "sabbatical". It was to be a controversial Grand Prix as Niki headed the so-called "driver's strike" against the new superlicense conditions. It was also Niki's first outing in the then still very radical McLaren MP4 which was the first carbon fibre F1 car and more than a handful to drive (it earned Niki's predecessor Andrea de Cesaris his nickname "De Crasheris"...). In the end, Niki drove his MP4 home in a leisurely fourth overall, just outside the podium. These valves come from his engine and were polished, chromed and mounted for the now defunct establishment called Grand Prix Sportique in Tetbury, UK. 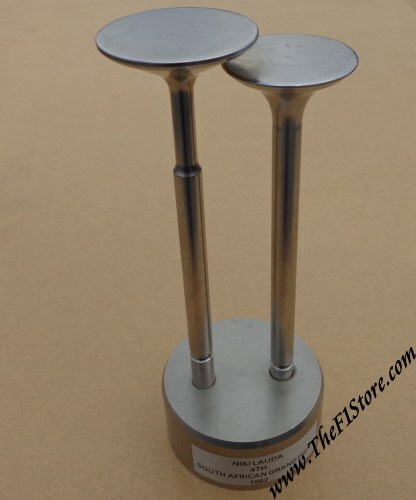 The wholes stands some 13 cm or a good 5 inches tall while the pedestal measures some 5 cm or 2 inches in diameter. It is quite a heavy and very decorative set.